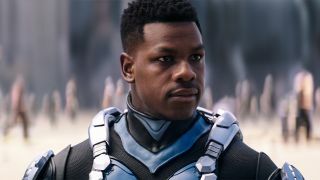 “The challenge is that the Precursors didn’t stop brainstorming, even though they were defeated in the first film,” adds John Boyega, the franchise’s new star. “They’ve come up with another way [to attack]. Change was also afoot behind the camera, where scheduling conflicts meant that Pacific Rim creator and director Guillermo del Toro opted to go off and direct awards darling The Shape of Water instead. "We didn't want our film just to be a pale imitation of the first"
That left the shot-calling vacancy that DeKnight subsequently filled. While Uprising marks his debut as a movie director, he has plenty of experience in TV, as a regular writer in the Whedonverse, and showrunner of both Spartacus and the brilliant first season of Daredevil. And of course, he had the producing del Toro on speed dial if he needed him. DeKnight realised his follow-up required three key elements to work. Bringing back Jaegers and Kaiju was effectively a no-brainer, as was the “drift”, the psychological connection shared between two or more Jaeger co-pilots – essential because mental stress of driving one would be too much for a single brain to handle. “The other thing for me was really this whole concept of the world coming together, putting their differences aside, where it doesn’t matter where you’re from, it doesn’t matter who your parents are,” DeKnight adds. “It just matters that we’re working together, that we’re stronger together. I think that in these turbulent times it’s a message that really resonates. Then, another of those pesky “scheduling conflicts” struck the film. Charlie Hunnam, who played lead Jaeger pilot Raleigh Becket in Pacific Rim, was all set to reprise the role. But within 48 hours of DeKnight finishing the script – before Hunnam had even had the chance to read it, in fact – the star was out, opting instead to make his own passion project, a remake of Papillon. It didn’t help that Stacker had such a strong relationship with his adopted daughter Mako – Rinko Kikuchi reprises her role in the sequel (where Mako’s now running the PPDC), as do Charlie Day and Burn Gorman as scientists Newton and Hermann. And that hits the nail on the head, because – like Transformers – Pacific Rim: Uprising will live or die on the strength of its mecha. “I was heavily involved as a producer in many aspects of the film, and I was conscious of all the Jaegers,” Boyega explains. This feature originally appeared in GamesRadar+'s sister magazine SFX, issue 298. Pick up a copy now or subscribe so you never miss an issue.